Brüsel was a sudden and unexpected but at the same time rather surprising and interesting stop on our bookstore browsing jaunt. It wasn't on our Brussels checklist, but the store's colorful windows caught our attention and basically forced us to enter. Perhaps it's not what you would call your typical bookstore since it's much more - said to be a bookstore gallery - it is certainly adorable and there was something specific about it and thus Brüsel just had to find its place among the rest in Bookstore Guide. Belgium is a country obsessed with comics and we've stumbled upon several stores specializing in this domain, however, Brüsel clearly stands out. The walls painted in deep red create the right environment for all the comic books and graphic novels which are displayed all over the place. Entering Brüsel basically equals entering a whole different world, far away from the sometimes faded reality, where you find yourselves surrounded by a whole range of characters brought to life in a 2D parade packed with colors and action. The store is divided into two floors, the upper one serving as a gallery where exhibitions of all sorts of graphic art take place on regular basis. 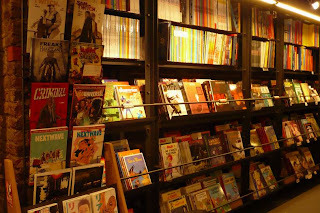 The ground floor stocks everything related to the comics culture - comic books and beautifully done graphic novels from well known but also more obscure and underground authors, as well as some titles focused on art and design in general. And since an important number of the titles displayed is in English language, this bookstore managed to meet the ultimate condition to appear in our Guide. Besides books and comics you can also choose from postcards, posters and lots of figurines, toys and other collectibles related to this subculture. 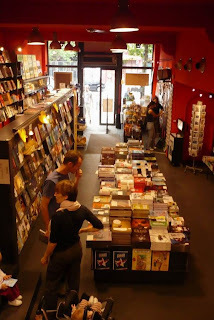 Add the friendly and helpful staff and you have bookstore which, in our opinion, will leave you looking around in amazement not knowing where to turn first.